I first became interested in the PMC for the physical challenge aspect but I quickly realized that it was much more important than that. Cancer is so widespread. Unfortunately we all know someone who has been impacted by cancer. What impressed me the most was the funds raised by the PMC and how the donations make a huge difference in people's lives and in the fight to end cancer. 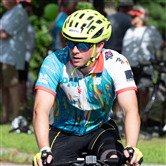 It's been since high school since I last rode a bike but when my sister Stacy brought up the idea of taking on the Pan Mass Challenge together, I knew it was an opportunity I couldn't pass up. We were fortunate enough to join the fantastic team of PRECISION FOR KIDS supporting Dr. Katie Janeway in her fight against cancer at Dana Farber. Every dollar raised goes towards her team's efforts to help cure children diagnosed with cancer by leveraging their cutting edge precision medicine. I am excited for the 192 mile 2-day cycling challenge and the new friends I am making along the way. More importantly I am grateful to be part of this team that is driven to help find a cure. Thank you in advance for your contribution and supporting my ride!